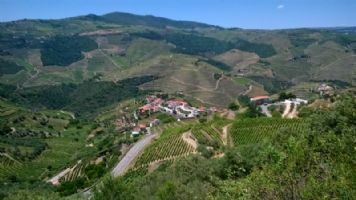 A trip through the Douro wine region takes you through mesmerizing scenery with inspiring landscapes. A land shaped by the Douro River and its people, that from the schist soils create World class wines- Port wine and red wines, as well as renowned olive oils. Since the Roman occupation the vineyards have been planted and the land have been worked to the known Terraces of today UNESCO protected area. But more is to be found, little villages hanging from the slopes or the rock art engravings that from millenniums are scattered in the countryside and now possible to visit. The unique symbiosis between the river and the terraces that have shaped both land and man into a culture that is deeply linked to this majestic river. Day 1 Welcome at Porto & Transfer to Lamego. Our guide will welcome you at the Porto Airport. We will travel to the Lamego town where we will stay for the night . Depending on the time of arrival we might go for a stroll along the town center, walking towards the castle and the sanctuary and finish by the 12th century cathedral. 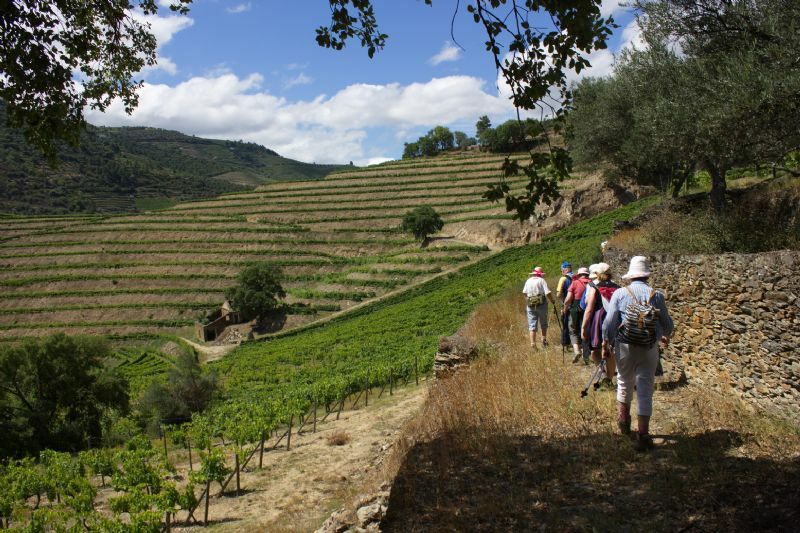 Day 2 Hike the Douro Wine Terraces. The day starts with a short transfer to TabuaÃ§o. The hike starts across the old town center and goes through the townÂ´s small streets that are full of history. Shortly after leaving the center we will enter the vine terraces, and we will be heading to a small wine-producing estate. A wine tasting awaits us. We will take time to rest, and go for a picnic. 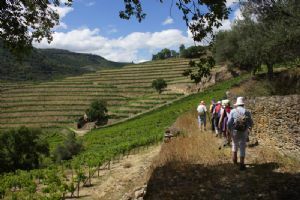 The hike continues along the slopes and vine terraces and ends in Barcos, one of the traditional and emblematic Douro wine producting villages. At end of the hike we will be transfered to Vila Nova de Foz CÃ´a. Day 3 Hike the CÃ´a Valley & Visit Paleolethic Rock Art. The day begins with a visit to the CÃ´a Museum, where we will learn about the paleolithic rock art engravings in the region. At the CÃ´a Valley, we are at the center of the largest open-air Prehistoric rock art site, and an UNESCO World Heritage Site. In the afternoon, we will go for a hike through the surrounding valleys, crossing olive groves, and fields covered with almond trees and vineyards. We will walk along the banks of the CÃ´a River until we reach the engraved rocks. The CÃ´a valley hosts as well some rare Neolithic and Iron Age engravings. Day 4 Marialva Historical Village Hike. Another very different area of the Douro, after a 30min transfer we arrive into MÃªda. The hiking will take us to valleys and toward the historical village of Marialva dating well before the 9th century AD. To get there we follow ancient trails that linked the villages, and will visit the castle and surroundings of Marialva. In between the village old streets will wonder and discover the ramparts and the Castle Church to exit via an old trail to Longroiva. Longroiva is a spa village that also feature historical sights and medicinal waters. Day 5 Hike River PinhÃ£o Valley & Favaios Plateau. Small transfer to Magellan Town to see his birth place and start todayâ€™s hike. The PinhÃ£o river valley will be the main feature, has we descent toward it. After crossing the River the hike leads us to a little village for a wine tasting in a small but very good winery. The table is waiting for us with regional delicacies and wines. The hike continues toward Favaios another wine village of Portugal and we hike all the way to our Hotel. Day 6 Hike AlijÃ³ to Vale de Mendiz. Across Favaios plateau and the vineyards of yet another fortified wine: the Favaios wine. Fabulous to have as an appetizer. We return into the village this time visit one of the oldest bakeries in the region. These are still working manually, and the wood still heats the oven to bake this famous bread. One just off the oven will be tasted with butter and why not a favaios!!! The Walking is now following the ridge of the valley with stunning views over the terraces the river and the skyâ€¦. All to finish into a little village hanging into the slopes, just the true image of this mighty Douro Region. Day 7 Hike Porto Historical Town. After an early breakfast and transfer to Porto this morning we'll begin our 3-4 hour walking tour in downtown Porto. Portugal's second-largest city gave its name to the country's most well-known wine export and served as the center of its ship building industry during the 14th and 15th centuries. Today's walk will explore Porto's narrow streets and ancient buildings from its historical center, classified as a UNESCO World Heritage Site. Along the way, we'll learn about the first Portuguese kings and the town's centuries-long rule by local Bishops. At midday we will reach the Ribeira district, facing the Douro River. The traditional Rabelo cargo boats anchored along the river tell the story of port wine, which has been transported by these vessels for centuries. Across the river, we'll climb to the circular-shaped church and cloisters of the 15th-century Serra do Pilar monastery for memorable views of Porto's downtown area. Some free Time before the Fado diner in the Ribeira District. Day 8 Free Time & End of Program. * Guided Visit to archeologic rock art site. * Liability and personal accident insurance (as in Portuguese Law).